Objective To characterize the clinical presentation of newly diagnosed type 2 diabetes of ethnic minority adults in Chicago and compare with other populations. Research design and methods Cross-sectional study examining the data of 2280 patients newly diagnosed with type 2 diabetes treated between 2003 and 2013 in a large Chicago public healthcare system. Results Mean age of the patients was 49±11.3 years, men 54.4%, African-Americans 48.1%, Hispanics 32.5%, unemployed 69.9%, uninsured 82.2%, English-speaking 75.1%, and body mass index was 32.8±7.4 kg/m2. Microvascular complications were present in 50.1% and macrovascular complications in 13.4%. There was a presence of either macrovascular or microvascular complications correlated with older age, hypertension, dyslipidemia, inactivity, speaking English, and being insured (p<0.01). Glycosylated hemoglobin A1c (HbA1c) at presentation did not correlate with diabetes complications. In our cohort, when compared with a diverse population in the UK and insured population in the USA, HbA1c at presentation was 10.0% (86 mmol/mol), 6.6% (49 mmol/mol), and 8.2% (66 mmol/mol); nephropathy was 22.2%, 16.7%, and 5.7%; retinopathy was 10.7%, 7.9%, and 1.4%; and neuropathy was 27.7%, and 6.7% in the UK (p<0.001). There were no significant differences between groups in the prevalence of macrovascular complications. Conclusion These results show the vulnerability of underserved and underinsured patients for developing diabetes complications possibly related to a delayed diagnosis. Patients with newly diagnosed type 2 diabetes usually harbor the disease for a few years before being diagnosed. These patients occasionally present with complications at the time of diagnosis. In underinsured ethnic minority patients with newly diagnosed type 2 diabetes, there is a much higher prevalence of complications when compared with insured patients with newly diagnosed type 2 diabetes. The changing landscape of health insurance in the USA may result in less coverage especially for minority populations resulting in higher risks of complications at the time of diagnosis of diabetes. This is a retrospective cross-sectional study of patients in an underserved ethnic minority adult population in Chicago newly diagnosed with type 2 diabetes between 2003 and 2013. Data were collected by electronic chart review of 2280 adult patients who were newly diagnosed with type 2 diabetes and referred to our diabetes clinic within 1 year of diagnosis. The diabetes clinic is an American Diabetes Association (ADA)-certified diabetes center in John H. Stroger, Jr. Hospital of Cook County, a public safety-net healthcare system in Chicago, Illinois, USA. Inclusion criteria included adult patients (age ≥18 years) who were newly diagnosed with type 2 diabetes and referred to our diabetes clinic within 1 year of diagnosis. Diagnosis of type 2 diabetes was confirmed following ADA guidelines with at least two instances of glycosylated hemoglobin A1c (HbA1c) ≥6.5% (48 mmol/mol) (preferred method), documented fasting blood glucose ≥126 mg/dL, or one instance of symptomatic hyperglycemia with documented blood glucose >200 mg/dL.17 Exclusion criteria included pediatric patients (age <18 years), initial evaluation in our clinic after 1 year of diagnosis or unclear time of diagnosis, type 1 diabetes, or latent autoimmune diabetes in adults, or absence of HbA1c. The electronic database for our diabetes clinic was initiated in 2003 and collected demographic, clinical, laboratory, and treatment data. It also included the date of diabetes diagnosis that was identified at initial encounter when the diagnosis was made or by patient recall. Records of 22,333 patients were screened, adult patients (age ≥18 years old) who were seen in our diabetes clinic within 1 year of diagnosis were identified, and 2280 patients met the inclusion criteria as shown in the Consolidated Standards of Reporting Trials diagram in figure 1. The data were stored in a secure server of John H. Stroger Jr. Hospital of Cook County, Chicago, Illinois, USA. Data were electronically transferred to SPSS (Statistical Package for the Social Sciences) for statistical analysis. All statistical analyses were performed with SPSS, V.22 (SPSS, Chicago, Illinois, USA). Categorical data are presented as percentages and absolute numbers (n), continuous data are presented as means±SD for normally distributed values and by medians and IQRs for non-normally distributed data. The χ2 test was used for analysis of categorical variables and t-test was used for continuous variables. For multivariable analysis, binary logistic regression was used. Demographics and baseline characteristics of our Chicago cohort are shown in table 1. Most were African-American (48.1%) or Hispanic (32.5%), unemployed (69.9%), and 28.4% were non-English speakers. Mean body mass index (BMI) was 32.8±7.4 kg/m2 and 58.4% of the patients had HbA1c>9.0% (75 mmol/mol). The complication rates at presentations of our Chicago cohort are shown in table 2. Microvascular complications were present in 50.1%, including retinopathy in 10.7%, nephropathy in 22.2%, and neuropathy in 27.7%. Hypertension was present in 69.4%. Macrovascular complications were present in 13.4% including CAD in 4.3%, CHF in 3.3%, PVD in 4.1%, and CVA in 1.9%. The factors associated with microvascular and/or macrovascular complications in our Chicago cohort are shown in figure 2. 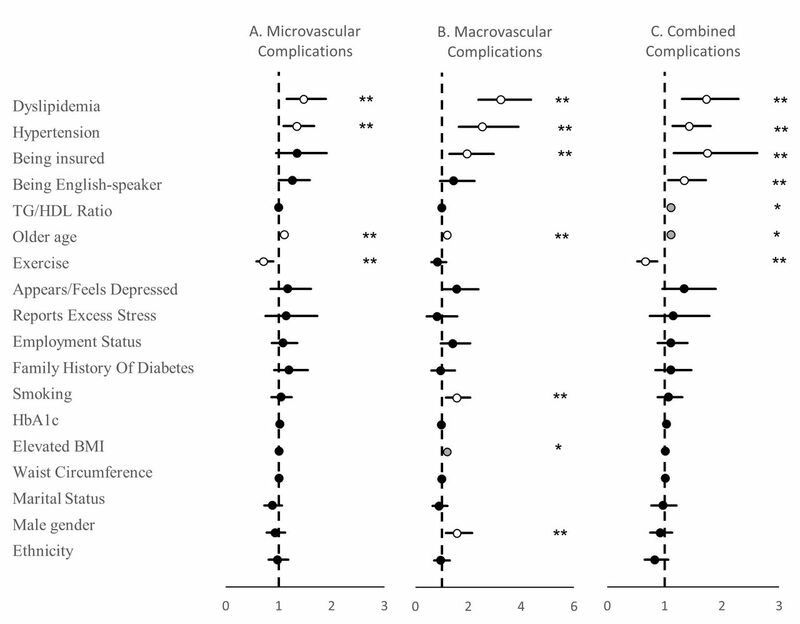 Microvascular complications correlated significantly with dyslipidemia (OR 1.47 (95% CI 1.15 to 1.89), p<0.01), hypertension (OR 1.35 (95% CI 1.09 to 1.67), p<0.01), older age (OR 1.02 (95% CI 1.01 to 1.03), p<0.01), and inversely with exercise (OR 0.72 (95% CI 0.58 to 0.90), p<0.01). Macrovascular complications correlated significantly with dyslipidemia (OR 3.23 (95% CI 2.38, 4.37), p<0.01), hypertension (OR 2.53 (95% CI 1.64 to 3.90), p<0.01), being insured (OR 1.95 (95% CI 1.29 to 2.96), p<0.01), male gender (OR 1.58 (95% CI 1.16 to 2.14), p<0.01), smoking (OR 1.56 (95% CI 1.16 to 2.08), p<0.01), older age (OR 1.05 (95% CI 1.03 to 1.07), p<0.01), and elevated BMI (OR 1.02 (95% CI 1.01 to 1.04), p=0.03). Both microvascular and macrovascular complications (composite outcome) correlated significantly with dyslipidemia (OR 1.73 (95% CI 1.30 to 2.29), p<0.01), being insured (OR 1.75 (95% CI 1.16 to 2.62), p<0.01), hypertension (OR 1.43 (95% CI 1.14 to 1.80), p<0.01), being English-speaker (OR 1.35 (95% CI 1.06 to 1.72), p=0.02), older age (OR 1.02 (95% CI 1.01 to 1.03), p<0.01), TG/HDL (triglycerides/high-density lipoprotein) ratio (OR 1.02 (95% CI 1.01 to 1.05), p=0.02), and inversely with exercise (OR 0.66 (95% CI 0.52 to 0.87), p<0.01). HbA1c at initial presentation, ethnicity, employment status, and marital status were not associated with any complications. 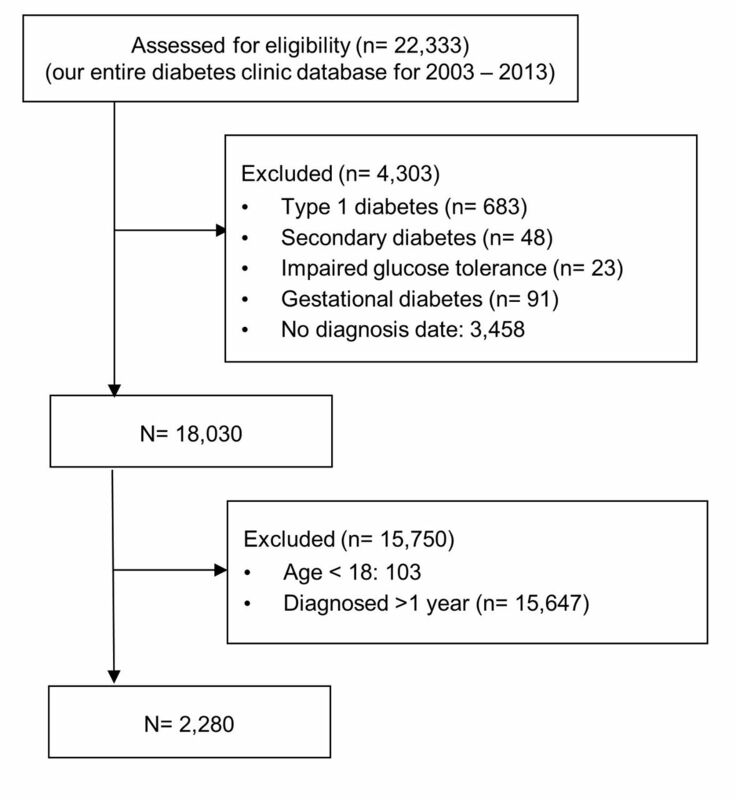 Factors correlated to type 2 diabetes-related complications on presentation in the Chicago cohort. OR (95% CI) for the factors correlated with diabetes-related complications at the time of initial diagnosis. Figure (A) represents correlation with microvascular complications, figure (B) represents correlation with macrovascular complications, and figure (C) represents correlation with the presence of both macrovascular and microvascular complications. **p<0.01 represented in white-filled circles; *p 0.01–0.05 represented in grey-filled circles; and p>0.05 represented in black-filled circles.BMI, body mass index; HbA1c,hemoglobin A1c﻿; TG/HDL, triglycerides/high-density lipoprotein. The comparison of our Chicago cohort to those newly diagnosed with type 2 diabetes in the other two cohorts—an urban nationally insured population from primary care practices in South London and a managed care population, 90% non-Hispanic whites, in Portland, Oregon16is shown in table 2. The Chicago cohort was younger (49.0 vs 55.4 and 55.7 years, respectively, p<0.001) and had worse HbA1c at presentation (10.0% (86 mmol/mol) vs 8.2% (66 mmol/mol) and 6.6% (49 mmol/mol), respectively, p<0.001). The microvascular complications in the Chicago cohort were significantly higher than in the other two cohorts especially nephropathy (22.2% vs 16.7% and 5.7%, p<0.001) and retinopathy (10.7% vs 7.9% and 1.4%, p<0.001). The composite macrovascular complications were comparable between the Chicago and Portland cohorts. However, the Portland cohort had a higher CAD rate compared with the Chicago cohort (11.2% vs 7.6%, P<0.001). The prevalence of composite macrovascular complications, however, were similar between the Chicago and Portland cohorts (no data in the South London cohort). The prevalence of CAD was higher in the Portland cohort versus the Chicago cohort. This difference may be explained by the significantly older age at diagnosis in the Portland cohort. This is further supported by the Portland study itself which showed those diagnosed at a younger age (<45 years) had lower rates of myocardial infarction history than those diagnosed at an older age (0.8% vs 13%). The strikingly high rate of complications and the poor glycemic control at presentation in the Chicago cohort in comparison to the two other cohorts needs an explanation. The differences in the ethnic composition of the cohort may be one. It is known that diabetic nephropathy is more common in African-Americans that comprised almost half of the cohort.21 However, the most important and plausible explanation for these differences is the different socioeconomic settings of the cohorts and above all the lack or insufficient medical insurance coverage of the Chicago cohort. The importance of medical coverage in achieving better health outcomes is well proven.24 This has also been seen in diabetes where health disparities in underinsured minorities resulted in worse diabetes outcomes.25 The comparison cohorts had medical insurance, the South London cohort through the National Health Service and the Portland cohort through managed care. The Chicago cohort was primarily uninsured and both the US cohorts dealt with patients diagnosed prior to the implementation of the Affordable Care Act (also known as 'Obama Care’) in 2014. The presence of microvascular complications in the Chicago cohort was associated with dyslipidemia, hypertension, being more sedentary, and with older age in a minimal degree. There was no association with HbA1c at presentation. The macrovascular complications were associated with dyslipidemia, hypertension, older age, smoking, excess stress and being male. It is less clear why having insurance was associated with the macrovascular complications. It was also associated with the composite outcome of microvascular and macrovascular complications. One explanation might be that presence of the complications in an insured setting prompted the diagnosis of new diabetes. The combined complications were associated with dyslipidemia, hypertension, being insured, older age, TG/HDL ratio, and lower exercise level. Being English-speaking was also associated with the combined complications and this association is not easy to explain. TG/HDL was shown in previous studies to be an atherogenic index and correlated with atherosclerosis.26 Taken together, the analysis of the factors that might have influenced the silent development of complications in the Chicago cohort did not give any special insight. Like in the Portland cohort, older age was associated with complications but to a much lesser degree. This retrospective study has several limitations. As a retrospective study, some of the data were based on patient history and not on objective provider documentation or testing. Since the study was based on past medical documentation, additional information not gathered in the documentation, such as assessments on health literacy, food security, and other possible covariates, could not be obtained. Retinopathy in many instances was based on history provided by patients that they were informed about having retinopathy with no documentation or specific diagnosis available to the providers. Assessment of depression or anxiety was subjective, based on provider history-taking and without the use of formal psychological tools for assessment. The study population came from a single healthcare system limiting generalizability yet this large healthcare system with its multiple clinic sites treats patients from a diverse metropolitan region encompassing the city of Chicago and its surrounding communities. In conclusion, the Chicago cohort study showed for the first time the pattern of clinical presentation of newly diagnosed type 2 diabetes in an underinsured urban minority population. In comparison to other cohorts with different ethnic compositions and above all with better medical insurance coverage, the Chicago cohort showed an alarming rate of diabetes complications already at the initial diagnosis of diabetes. The high prevelance of diabetes complications at the initial diagnosis may be a precondition, in this cohort and in other similarly underinsured minority populations, worse progression of diabetes and its disabling microvascular and macrovascular hard outcomes. All the data of the Chicago cohort represent a period before the enactment of the Affordable Care Act in 2014. The importance of this study is the demonstration that for the uninsured/underinsured population there is, from the very beginning of the clinical diagnosis of diabetes, a high rate of complications. In the current era of uncertainty about the future of extending medical coverage to economically weaker populations and even with the risk that the current coverage could be reduced, the current study illustrates the potential diabetes health risks if more patients will continue to be uninsured.
. Statistical theory and methodology in science and engineering . New York: John Wiley and Sons, 1965.
. UK prospective diabetes study 6. Complications in newly diagnosed type 2 diabetic patients and their association with different clinical and biochemical risk factors. Diabetes Res 1990;13:1–11. Contributors MM constructed the research, performed the statistics, and wrote the manuscript; BT revised and edited the manuscript; LoF reviewed parts of the statistical analysis of the study; LeF directed the research, provided the data from the diabetes clinic database, reviewed the statistics, and guided and edited the manuscript. LeF is the guarantor of this article. Ethics approval Institutional Review Board of John H. Stroger, Jr. Hospital of Cook County, Cook County Health & Hospitals System.